I’ve been tinkering with the idea of getting a Dust Deputy for a long time. I finally took the plunge. I’m not going to say too much about it, other than I am extremely pleased with its operation. I can’t believe how well it works, and I’d recommend it to anyone. As you can see from the photos, my shop partner, Phoebe, approves as well. Her newest thing is to watch proceedings from the deep sink. Question: Does Phoebe sit in there for safety reasons? This is what I did with mine, it works very well. I have the DIY version, but I love mine. Bubbs … You will not be sorry. I have had mine for about 4 years now and it does a great job. I bought one a couple of months ago, and it makes a huge difference in my shop. I love mine. Did you reinforce the top with a wooden ring? I found mine started to sag just a little from the weight of the hose after e few days so I put a piece of 3/4 ply on the inside and replaced the top through bolts with longer ones. Thanks for the tip Marty5965, I’ll keep an eye on it. Oldtool…LOL I’ll have to ask her. when you do fine dust with the table saw does it clog the vacuum filter. Mine still clogs the filter of the vacuum works fine to pick up big chips. On just about any 2-stage system, fine dust is going to end up in the filter. Some cyclones do a better job of dealing with the fine dust than others, but for the price, the Dust Deputy is about the best of the breed. 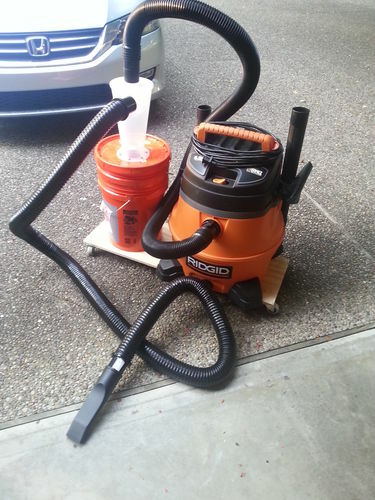 I have a HEPA filter in my Ridgid vacuum … about every other time I dump the bucket, I pull the filter out of the Ridgid, take it outside, and blow the dust out of it. Mine has never clogged. I’m really digging the clean and simple floor caddy you have your setup on. I was on the fence about the Dust Deputy, but seeing your review (along with some others) has made me realize it’s time to throw down and get one. Short, but effective endorsement for the Dust Deputy. Thanks! 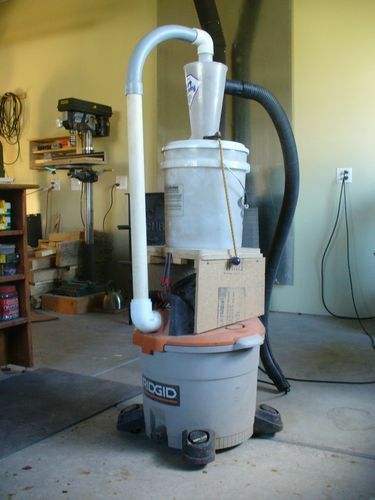 I have a dust deputy for my basement work with a old Sears vac. Now that it is warm out, I added a second dust deputy with a rigid vac. This vac is extremely quiet but yet powerful. The platform is on gray rubber casters. The vac simply rests on the platform (so I can remove it easily to use it for something else and will run on its own wheels) and the bottom bucket is screwed into the platform. This works very well and is very mobile. The dust deputy catches the vast majority of the dust and material. Very little reaches the vac and you will have on those expensive vac filters.